A Connecticut Yankee in King Arthur’s Court is one of the most famous stories about travel in time. Good-natured and enterprising idealist Hank Morgan found himself in the United Kingdom of the 6th century. Any other person in his place would have decided that there is no chance to avoid death, but the protagonist immediately grasped how to exploit the situation and not only escaped the execution but also succeed in the court. Citizens of the Kingdom were naive as children, and Hank easily manipulated them, pretending to be a wizard. From the very beginning, he became famous thanks to the solar eclipse, which was taken as a result of his witchcraft. King Arthur gave him the title of the principal minister, and over time, people began to call him “The Boss.” During all the stay in Medieval England, society surprised him with the obtuseness, and he struggled to accelerate the development of civilization, despite many obstacles. The church was one of Hank’s worst enemies, as it not only made everyone acquiescent but also rob people of their property and harvest, the same as the aristocracy. The main character was so loyal that he even did not want to destroy religion; he planned to introduce Protestantism and give every person the right to choose what to believe in. The main opponent of Yankee was old wizard Merlin; his witchcraft was good for nothing, and the protagonist made a fool of him again and again because magic is powerless before science. However, the stranger did not wish to harm Merlin; he did not want to kill him or even banish from the kingdom, but the warlock did not appreciate the goodness of his enemy’s soul and always tried to put sticks in the wheels. Being the principal minister, Hank created underground academies, began to publish a newspaper and chose as an assistant a smart fellow named Clarence, who controlled everything for what The Boss did not have time. The protagonist faced with the senseless, cruel law; even free people were treated like animals; aristocracy bled them dry and scoffed at everyone, who did not have noble pedigree and wealth. Slaves had much worse; the main character could not bear to see their suffering, but he was not able to change established habits and traditions in one moment. Once Hank and the king in the likeness of ordinary villagers went for travel the country. They saw terrible injustice with their own eyes, but the monarch was not able to look at the situation under a not familiar angle; only after experiencing slavery, king Arthur stopped defending interests of cold-blooded lords. From the very beginning of their captivity, the king was concerned only at the price for which he was sold, and after a while, he became an inveterate enemy of slaveholders. The principal minister came up with an escape plan, but everything went wrong; the slaves raise the rebellion, and all of them were sentenced to death by hanging. 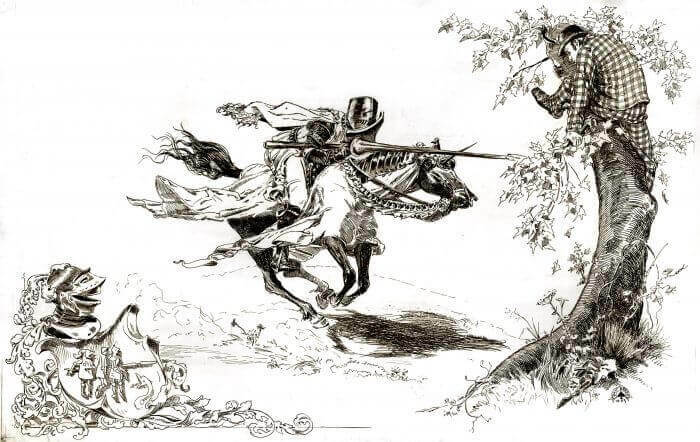 Though Hank had managed to inform Clarence about the trouble, and the assistant with valiant knights on bicycles saved the condemned at the last moment. The main character also set the goal to extirpate knighthood. Sir Sagramore challenged him to a duel because of a misunderstanding. Mind won brute force; after several victorious fights, Hank defied the whole knighthood, and in this way, duels disappeared, because nobody wanted to go to their deaths. When Medieval England was on the way towards civilization, things went out of hand. The church published the Interdict. People were not ready to live without a spiritual guide; the state of affairs depressed them. Discord began in the kingdom, the king died, and aristocracy, having secured the support of people, attacked Hank and his friends. The Middle Ages lost to technological progress – all the enemies were killed by electric current. Then Hank went out to help someone who could be alive, and a wounded knight seriously injured him. Crafty Merlin entered the shelter and put the main character to sleep for 13 centuries; his allies were infected because of putrefaction of thousands of corpses, so, ironically, the stranger destroyed what he had created. Hank woke up delirious, talking to Sandy, and died without realizing what is going on. The Yankee (or Hank Morgan) – The central character and narrator of most of the book, his name is not given until close to the end. He is identified in various ways by the other characters in the book, most often by the title given to him by the common people of England, “The Boss.” He is practical, business-minded, hard-working, determined, resourceful, intelligent, and possessed of an unbelievably good memory. He has a firm idea of right and wrong, and he is a staunch proponent of American democratic and capitalistic ideals. He believes in the power of technology and progress and detests narrow-minded adherence to superstition. He is a devout Protestant who values religious freedom and blames the Established Catholic Church for many of the ills of medieval society. He is a born leader, and the idea of inherited rank and strict social stratification disgusts him. Clarence (or Amyas le Poulet) – The Yankee’s most trusted friend. He begins as a friendly but fairly ignorant page who takes a liking to the Yankee and offers him aid. He responds magnificently to the Yankee’s tutelage and, by the end of the book, becomes thoroughly indoctrinated in the manners, speech, skills, and ideology of nineteenth-century America. Sandy (or Alisande) – A pretty but somewhat flighty damsel who comes to Arthur’s court seeking assistance and becomes attached to the Yankee. The Yankee finds her terribly annoying at first, but she proves to be quite useful and pleasant. She is a product of her times in every way, believing fully in the righteousness of social stratification and the power of the supernatural, but she improves greatly through her contact with the Yankee and even teaches him a thing or two. King Arthur – A wise and gracious king. He tries his best, but he has a full share of the prejudices and superstitions of the day. The Yankee’s opinion of his intellectual capacity varies, but he is capable of learning and of correcting his mistakes.